Why is there evil in the world? It is one of the most fundamental questions that confronts us in life. In one of my recent blogs I discussed how our natural proclivity to ask questions can lead to meaning. What may have occurred to some of you to ask is, what happens when the answers we get are wrong? The answer is, it depends. Wrong answers can lead to further discovery of meaning as we eliminate and discard those wrong answers and narrow our search for answers among those things that remain. However, if we get an answer that is wrong, but we either unintentionally act as if it is the correct answer or what is worse intentionally accept the wrong answer, the consequences can range from, no big to deal to a very big deal. And here is where evil arises. The intentional acceptance of an answer to questioning can lead to grievous errors and ultimately to evil. Examples have appeared in this blog in different contexts. For example, questions about the nature of God, and the kingdom of heaven lead religious leaders to concoct answers that had nothing to do with reality. They placed the earth at the center of the universe, constructed icons and fetishes to represent God; waged wars against those who had a different answer than they and thereby unleashed untold evil upon humankind. Questions about the nature of man led philosophers and statesmen to wrong answers that said races other than their own were inferior or what is worse, in the case of the United States, that some races were subhuman. The evil that ensued need not be recounted here. The recent worldwide economic crisis has been blamed on Wall Street, big banks, callous mortgage lenders and whomever the proverbial finger can find to point to. The truth is, in our attempt to find meaning we have believed that one of the answers is material wealth. We believe that capitalism is the answer, the foundation of which has become consumer spending. We have gone well beyond the question of basic needs and the answer of food, shelter and clothing to what Plato characterized in the Republic as a society at a “fever pitch” needing all sorts of meats, relishes, condiments and comforts well beyond the basics of food, shelter and clothing. Let’s stick with the economy for a moment as it is something everybody can relate to and therefore serves as a good example of how evil is born. What we call capital is NOT money. Real capital is produced when labor is combined with raw resources to produce something of value. A shoemaker is a good example. A maker of shoes applies his skilled labor to the the raw material of leather and produces a pair of shoes. That pair of shoes is capital. A farmer may apply his or her labor to raw land to produce crops. Those crops are also capital; and so long as the farmer does not appropriate more land than he can make use of in the simplest state of man’s relationship to other men the farmer does not injure anyone. Furthermore, as long as he does not produce more than he can use and nothing of the crops spoil, he has done no harm. This is essential in understanding where evil can arise within simple economic relationships. In our simple example of the farmer and the shoemaker, both have produced capital and may agree to exchange their capital for something of value they need. The farmer may trade an ear of corn for a pair of shoes. Or the shoemaker may place a value of a bushel of corn for a pair of shoes. So long as the shoemaker’s value for the shoes does not exceed his ability to use the corn, that is none of the corn spoils because he can’t use it all, he has done no harm and the value is a fair value and if the farmer feels the pair of shoes is well worth the bushel of corn both parties are pleased and not injured. Now, let us see what happens when money comes on the scene. If in our example the shoemaker believes his shoes are worth ten bushels of corn, it will do him little good if the corn spoils before he can make use of it or trade it for something else of value. So by agreement the farmer and the shoemaker assign value to a piece of metal, like gold or silver. Instead of a bushel of corn the shoemaker and farmer agree that one gold coin is the value for a pair of shoes. Unlike the corn, which can spoil, the piece of metal does not spoil and the shoemaker can begin to hoard as much of the metal as he wants. The money is a representative form of the real capital, which in our example are the shoes and corn. The positive utility of money can’t be denied. But this positive utility exists only so longs as there is “real” capital backing the representation. However, as soon as one confuses “real” capital with its representation the trouble begins and the evil begins to gestate. The first hint of trouble comes when “money changers” read bankers and lenders who have hoarded money figure out that they can use money to make more money. 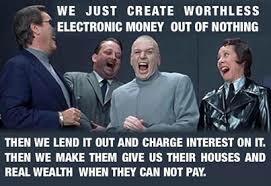 They begin to lend money to others with interest or usury who want to use the money to create additional capital. The borrower takes the money and uses it to build a bigger factory to make more shoes. On the surface this all sounds fine. The shoe maker gets needed money to expand, the consumer gets more shoes and the lender “makes” money through interest or usury. However, things begin to get complicated when the shoemaker realizes he must pay back the money he borrowed along with the interest. To do this, he charges the buyer of the shoes more than the actual value of the pair of shoes. A pair of shoes that buy convention was valued at say $2 now becomes $2.05. $.05 is given back to the lender for each pair of shoes sold plus the original $2 borrowed. The banker is $.05 richer. Multiply this $.05 by the number of borrowers and the amount borrowed and you begin to see how bankers get rich. But let’s be careful and more precise here. When the shoemaker and the farmer in our first example agreed upon the value of their capital(shoes and corn) being represented by silver or gold things seemed okay because of the rarity of the metals and the fact that labour had to be applied to natural resources to mine the precious metals. This fact, however, made it difficult for the money changers to exploit the concept of money. If they could replace precious metals with some agreed upon other commodity that was more easily produced, then they could create the illusion of more capital existing than existed in reality. Ah here is where the story becomes intriguing and society becomes a victim of its own greed. Stay tuned for the next installment. The farmer and the shoemaker have a lot more to teach us. The paper money : a slavery system which serves a “few” , not the good of Humanity. A slavery system exists only when there is a “master” of the slave…a controler of the slavery system. The slaves un-aware of their state of slavery, are living ne Sockholm syndrom. Who are the “few” ? All members of Corporations who are themselvesi slaves – I mean slaves suffering of the Stockholm syndrom – have been and still are controled…By whom ? Let’s remember that ALL GOVERNMENTS ARE CORPORATIONS (for example, Canada is duely registred at Washington DC as the13th District of the Federal Reserve Bank). Corporations exist to make money. Therefore governments exist to make money. Who elect governments ? The slaves (asleep) who will work to bring money to the governments, the masters , the few who control the slaves – the few who control with un-natural laws, and cameras, with gmo food, etc also with vaccines and deseases such as ebola and hiv. Let’s wake up ! Wake up to who we truly are…SOVEREIGN beings. Do we need money to live ? No. If one says yes, he has given away his freedom. He is a manipulated poppet, in fears. He is ignorant. If one answers “may be” , he starts to become aware of his humanity…. Hi, Don, I think you are on to something very interesting here. I would like to share with you my experience with money lenders plus my background in economics, which used to be my hobby. Right now I’m in Panama, arranging to retrieve our dog and to close out the apartment. But I want to talk with you more about this when I get back.